This black and white (Commerson's dolphin) trinket box is cast from pewter. It is hand-painted with a thick, glossy, enamel-like paint. The box features fine-silver plating, and several Austrian crystals. Each crystal was placed with care under the skill hands of a master artisan. This box opens and closes with a magnet for a clasp. The magnetic clasp is a great since it allows the box to open easily, yet close firmly. 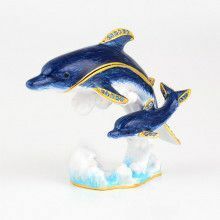 This dolphin trinket box arrives complete in it's own gift box.